Good News to UNIQLO fans worldwide! Uniqlo's Newest Global Flagship Store Steps Foot in Hong Kong and will be opening in Late April in the Heart of Causeway Bay. UNIQLO announced last March 3, 2013 that its newest global flagship store, the UNIQLO Lee Theatre Store, is set to open its doors to stylish and discerning Hong Kong shoppers on 26 April 2013. Imagine, this impressive new store will span three floors and boast over 37500 square ft. of shopping space in the Lee Theatre, located in the centre of Causeway Bay’s fashionable shopping district. I bet the girl in a greenscarf all over will be so thriled! UNIQLO first launched in Hong Kong in September 2005 and currently operates sixteen stores in the city. The brand enjoys a particularly strong presence in the local market thanks to consumers’ strong enthusiasm for UNIQLO’s exceptional quality at competitive prices. Situated in Causeway Bay, Hong Kong’s most esteemed fashion district, UNIQLO’s new global flagship store will showcase the latest and greatest from the brand’s basic wear culture. 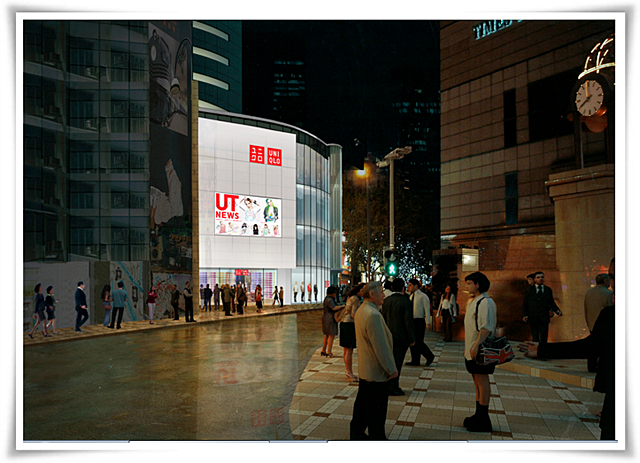 Shoppers will be able to experience a distinct and satisfying shopping journey at this impressive UNIQLO location. As a brand, UNIQLO is dedicated to designing functional clothing that comes in a wide variety of selections, all of which feature exceptional quality and fresh styles. The Lee Theatre Store will serve as a giant leap forward for the brand in the region and will certainly benefit its continuous global growth. UNIQLO is a brand of Fast Retailing Co., Ltd., a leading global Japanese retail holding company that designs, manufactures and sells clothing under seven main brands: Comptoir des Cotonniers, g.u., Helmut Lang, J Brand, Princesse tam..tam, Theory, and UNIQLO. With global sales of approximately 928 billion yen for the 2012 fiscal year ending August 31, 2012, Fast Retailing is currently the world’s fourth largest apparel retail company, and UNIQLO is Japan’s leading specialty retailer. UNIQLO continues to open large-scale stores in some of the world's most important cities and locations, as part of its ongoing efforts to solidify its status as a truly global brand.Today the company has a total of more than 1,200 stores in 13 markets worldwide including Japan: China, South Korea, U.S., Hong Kong, U.K., France, Singapore, Russia, Taiwan, Malaysia, Thailand and the Philippines. UNIQLO operates an integrated business model under which it designs, manufactures, markets and sells high-quality, casual apparel. The company believes that truly great clothes should be supremely comfortable, feature universal designs, are of high quality and offer a superb fit to everyone who wears them.